The Bridgemen family purchased their cabin along the Gunflint Trail on Poplar Lake between Old Northwoods and Rockwood Lodges some fifty years ago. Paul the youngest of seven children spent many summers at the family’s small frame cabin. This past year the old Bridgemen’s cabin, which originally was one of Doc Rimples Northwood Lodge’s cabins was torn down and replace with a new winterized building. The other day Paul his wife and his brother Dan and his wife were up working on this new cabin. Paul was not feeling well; he went outside to sit in his vehicle. When Paul did not return his wife went outside to check on him and found him unconscious. 911 was called and the family members attempt to revise him with CPR. He died as both the Gunflint and county Ambulances arrived. The following is the obituary from the Minneapolis Tribune, April 28, 2009. At Minnesota Bed and Breakfast Association (MBBA) annual meeting held in Duluth Barbara Young, Poplar Creek Guesthouse B&B innkeeper was elected the Association's new President. Joining Young on the Association’s Board of Directors were Shannon McKeeth, Bingham Hall from New Ulm as Vice President, Chuck Dougherty from Stillwater as Treasure, and Mary Grover from Soglimt B&B in Duluth as Secretary. Filling out the Board were innkeepers from Auf Deutschtrasse in New Ulm, Mathew Burrows 1890 Inn and the Olcott House in Duluth, the Summit Inn in Center City, the Pillar Inn in Cold Springs, Cedar Rose in Alexandria and the Candlelight Inn in Redwing. Outgoing President Suzanne Tweten will remain on the Board as past President. Pam Thorsen from Hasting’s Classic Rosewood Inn and Spa serves as the organization’s Executive Director. This year’s Annual Meeting entitled “Its Inn to be Green” spotlighted developing green sustainable Inns. The meeting featured seminars offering green programs from “Using Renewable Energy,” “What B&B’s are doing to be Green,” to “worm Composting.” Meanwhile venders were hawking green and other use innkeeper produces throughout the two-day meeting. . Other seminar topics included marketing, table setting, and more were also offered. One new program unveiled at the meeting was a State promoted farm and forest stay program where guest would be able to visit and stay at working farms. According to Young, “Duluth provide a great venue for this year’s annual meeting, the seminars were outstanding and the many venders in attendance offered us many useful products. But most importantly we had a great time! The MBBA represents some one hundred and twenty B&B and Historic Inns from throughout Minnesota. In the mid-Gunflint Area from the “Pines” to about Gunflint Lake winter still lingers on in the shady spot and in the woods where continues snow from one to two feet remain. Along the Banadad Ski Trail the ski conditions are still great with bare spots only in sunny open areas. Once you get much past the South Gunflint Lake Road where the Ham Lake Fire took place conditions change drastically. Here must of the snow is gone- must likely due to the lack of shad in this area’s burned over forest. Also, as it usually happens, the upper Gunflint area again this winter received a bit less snow then the mid Gunflint, which may have helped it to melt faster. Temperature are hovering in the 30s to 40s. April 17- Starting at Poplar Creek Guesthouse B&B, two skiers from Tofte skied 9-10 kilometers out and back on the Banadad. Upon their return they stated the skiing was great and they had an excellent time. The temperature was about 40 degrees. Today it is down below thirty and snowing. April 16, 2009. Six Kilometers of the east end of the Banadad Tracked. Great Spring Skiing! 12-16" of snow; no bare spots. You can expect snow on the Banadad to remain at least another two weeks. Right now the trail is in great shape. Also go "crust skiing" and travel anywhere in the area. Content: Sue Pavlatos will demonstrate and give individual design and painting instruction. She will instruct you in painting a water color picture that evokes a feeling of the Gunflint with a variety of techniques. All art supplys provided. Includes: One 4 hour art lesson taught by Sue Pavlatos, wine and cheese get together with the artist, two night lodging with breakfast each morning, buffet lunch and dinner. Sue Pavlatos is an accomplished artist and teacher. She owns a gallery and studio in Cloquet and Minneapolis. Sue is proficient in watercolor, acrylic and casein along with oils and pastels. According to Sue, -"Painting is a way to capture the moment. I enjoy connecting my life to the earth and water with paint. My images reflect nature's impact on my life." Sue exhibits regularly. Her work was included in the '94, '95, and '97 Ohara, Japan painting competitions. A member of the Duluth Art Institute and the Lake Superior Watercolor Society, Sue has exhibited nationally in the Great Lake Regional Art Exhibit, as well as the Arrowhead Art Exhibit and Red River Valley National Show. “Growing Wild” was the title of a recent one person show she did at Full Circle Gallery in Sioux Falls, SD and “Survivors on the Edge”, was a one-person exhibit at the Johnson Heritage Post Art Gallery in Grand Marais, MN. These paintings celebrate man and nature, and partnership and stewardship. April Fools Day brought 12 - 14 inches of heavy wet snow to the Gunflint Trail's Poplar Creek Guesthouse B&B and along the Banadad Ski Trail. On the morning of the first with guests planning to leave for home the roads and driveways into the B&B's two rental cabins had to be cleared. Plowing began at 7:30 am and five hours later the two and half miles of roadway to the Gunflint Trail was open and the guest were able to drive-out. In departing the guest declared the snow fall was great and they would not have been disappointed had they been snow bound for another day. Then guess what? It is still snowing- so far another 3 inches today. The Banadad remains snowed-in. The trail groomer is expected to begin opening the Trail on Friday, after the snow has settled a bit making it easier to groom. It is anticipated that about 5 or 6 kilometers of the east end of the Banadad and the Lace Lake Trails will be tracked by this coming weekend. 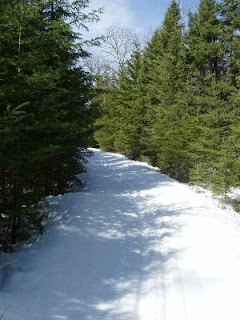 According to Boundary Country Trekking which maintains the trails, it is anticipated that with the addition of this snow fall the Banadad should remain ski-able well into April. Total measure snow on the ground at Poplar Creek Guesthouse is now 32 inches.